Experience the best of England, Ireland, Scotland, and Wales on this affordable British Isles tour. In between time in the major cities—London, Dublin, Edinburgh, Glasgow, and Cardiff—explore in-depth some of the historic towns and witness some of the breathtaking scenery.On any tour through Britain and Ireland, you’d expect to visit ancient ruins, majestic castles, and historic sights. That’s why Cosmos has included visits to prehistoric Stonehenge; Bath, known for its Roman ruins and baths; Edinburgh Castle, dating to the 12th century, where you’ll admire Scotland’s Crown Jewels; Hadrian’s Wall, the remains of the fortifications built by the Romans 2,000 years ago to defend against marauding northern tribes; the Mayflower Steps in Plymouth, where the Pilgrim Fathers embarked in 1620; Chester, where you’ll see the Roman remains and half-timbered buildings; the battlefield of Culloden Moor, where in 1746, the last battle was fought on British soil; and more.You’d also expect to see stunning scenery and lush landscapes on a Britain and Ireland tour. That’s why Cosmos has included a drive around the Dingle Peninsula, a dramatic drive passing seaside villages, ancient monuments, and views of the Blasket Islands; a drive on the 100-mile Ring of Kerry, with its rugged and magnificent landscapes; the spectacular 668-foot Cliffs of Moher, where rugged cliffs drop into the ocean; a scenic drive along North Wales coast to Chester; England’s tranquil Lake District, recently awarded UNESCO World Heritage status; and drives through rich dairy farmland. In the Scottish Highlands, drive through the rolling terrain interspersed with lochs (lakes), picturesque towns, and the sparkling coastline. Watch for Nessie at Loch Ness, Scotland’s largest lake.Bustling cities, smaller towns, historic sights, breathtaking landscapes, and much more are offered on this incredible and affordable Britain and Ireland tour. Day 7: KILLARNEY. RING OF KERRY EXCURSION. Day 9: LIMERICK–CLIFFS OF MOHER–GALWAY–DUBLIN. 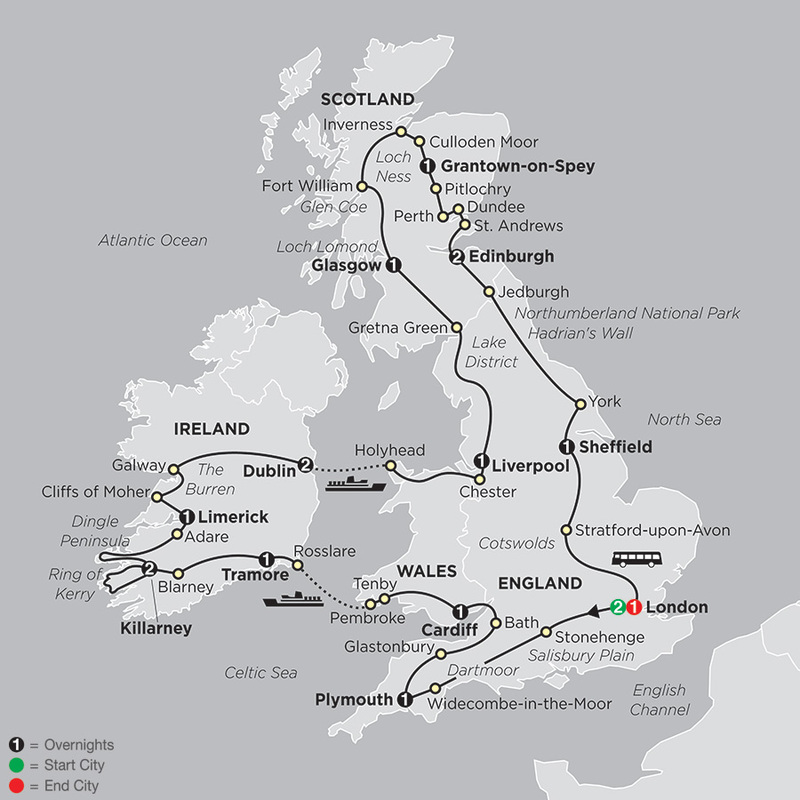 Day 12: LIVERPOOL–LAKE DISTRICT–GRETNA GREEN, SCOTLAND–GLASGOW. Day 13: GLASGOW–FORT WILLIAM–INVERNESS–CULLODEN MOOR–GRANTOWN-ON-SPEY.